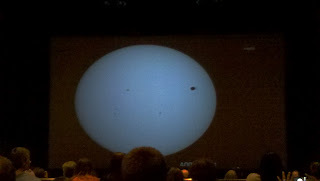 I recently witnessed a galactic event (ok maybe not that big...but still cool), the Transit of Venus. This event occurred back in 2004 and again a week ago; however it will not be seen again for another 105 or so years. Weird huh. 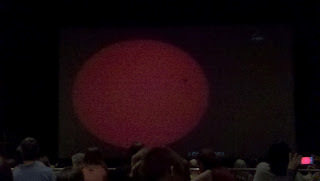 In short, the planet Venus passed in front the sun. Since it is A LOT further away than the Moon, it looks like a tiny speck against the sun instead of the cool ring of fire caused by the Moon in a solar eclipse. A good friend works at the Chicago Planetarium so I wasn't going to pass up that hook up. I guess everyone had the same idea because the museum campus was packed with amateur telescopes and crowds of school children. Clearly the 14 year old boy in me came as well because there were plenty of immature jokes, "can you see Venus yet...nope but I can try to see Uranus...ah ha ha ha"
The transit started in Chicago around 5pm. Honestly I thought it would be something spectacular, but it reality it takes about 3 hours to pass across. After ten minute of staring up with our solar approved paper glasses, it was like "okay what now". The real enthusiasts would be a bit disappointed because Chicago would miss the last hour or so of the transit since the sun passed below the horizon around 7pm. Thankfully the Planetarium had a live broadcast stream of the NASA telescope in Hawaii. Our connection got us in to watch. 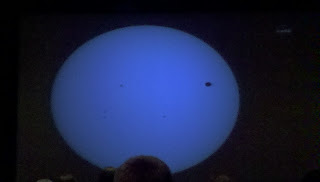 The NASA telescope would switch from normal to ultra violet to IR light (hence the blue sun). The funny thing is my friend Dameon, currently living in Nagano Japan, just blogged about this same event over there. Below are pictures from the NASA broadcast. 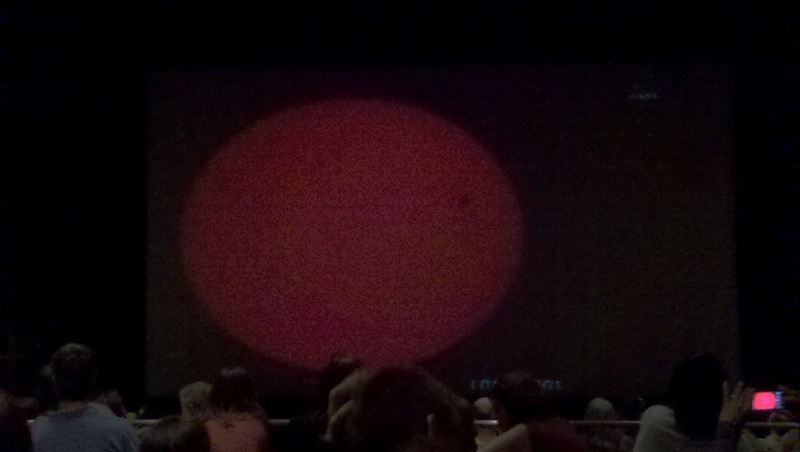 That tiny black circle is Venus. Whooooooooh!